1970 Dodge challenger SE – A website dedicated to our beautifully restored 1970 Dodge challenger SE. 1972 – 1974 Dodge Challenger – The ultimate source for lovers of the beauty late challengers. 440magnum Mopar Enthusiast Network – A large resource of classic and modern Dodge Challenger Information. Information on the first generation Dodge Challenger, Dodge Challenger Concept, Dodge Challenger R/T, Challenger SRT. Site also features a great collection of Dodge Challenger resources including a Directory, Screensavers, Wallpaper and more. 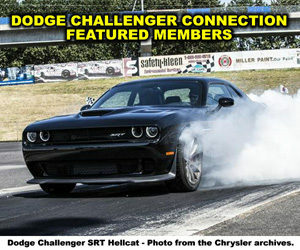 Dodge Challenger Resources – Dedicated to Dodge Challenger owners and enthusiasts. Site features Information, Links, Pictures, Screensavers, Desktop Wallpaper and more. Own a Dodge Challenger? Have it featured on our site!